The seventh season of The Met: Live in HD continues with the reimagined production of Rigoletto, starring Željko Lucic´, Diana Damrau, & Piotr Beczala and set in 1960 Las Vegas. A total of 4 live presentations and 4 encores remain in this not to be missed season. Each title will be shown live as a Saturday matinee followed by one evening encore on select Wednesdays following the live event. 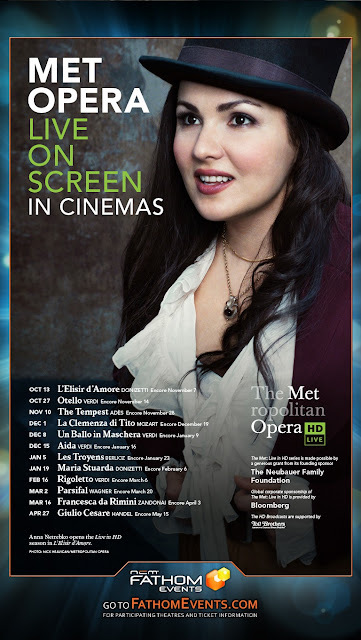 Visit http://www.fathomevents.com/performingarts/series/themetopera.aspx for more information about the entire series, including a full schedule, locations and ticket information. This post is written by Sarah Coulsey. She is a Wife, and Mother of two boys living in New England.